It feels like the bulk of 2012 and the first quarter of 2013 was spent trying to figure out which high school Jane would attend. She looked at schools from Pasadena to Calabasas and from Brentwood to Chatsworth. After a few months she came to us with a list ten schools long and we then began attending open houses and querying friends. Some schools were too big, some were too young, one was too religious and another was so progressive I got twitchy. It was sort of like Goldilocks and the Three Bears… we finally found her perfect fit, well as perfect as anything ever will be. 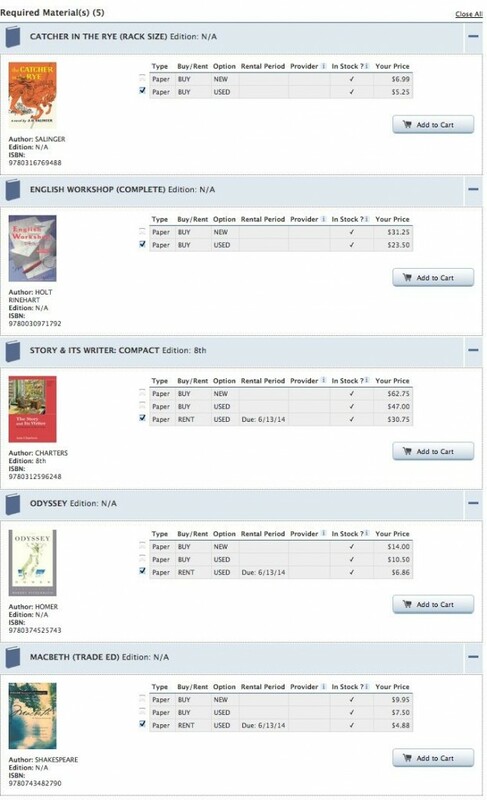 The book list came in the mail recently and dutifully logged on to eFollett.com to start the book buying process (can we all OMG together about the price of textbooks?!) when I noticed that quite a few of the schools that Jane had applied to also use eFollett and it would have been a wonderful resource when we were searching for schools. For instance you’d see that Marlborough’s 9th grade English curriculum includes reading The Catcher in the Rye, The Odyssey and Macbeth. Viewpoint’s 9th grade kids will be reading The Bible, Joy Luck Club, Julius Caesar, Oedipus and The Odyssey. For 7th grade English at Polytechnic in Pasadena, students will read Vocabulary From Classical Roots, Absolutely True Diary Of a Part-Time Indian and Of Mice and Men. Christina’s daughter, entering 7th grade at Viewpoint, will be reading Fahrenheit 451, From There To Here, Pearl, Romeo & Juliet, House On Mango Street, and Raisin In The Sun in English class. When I browsed the bookstore for 9th grade English books I found that the selections were mostly impressive. I did notice that one of the schools I’d not allowed Jane to apply to had only a textbook for 9th grade English and absolutely no literature. Fortunately for me this wasn’t a first or even a second choice school for my daughter so she didn’t push back too hard when I told her, “Dad and I just aren’t willing to pay for that school.” I had a suspicion that it was academically underachieving but some bookstore browsing could have helped me a year ago. Bookstore shopping isn’t a good way to decide that you want to apply to a school. I’d be lying to you if I said it was, but I found myself on the fence with a few of the schools. I sat and listened to their presentations and was wondering if they would deliver the great education they were selling. Capping off those presentations with a look-see in the bookstore could have made the decisions a whole lot easier. 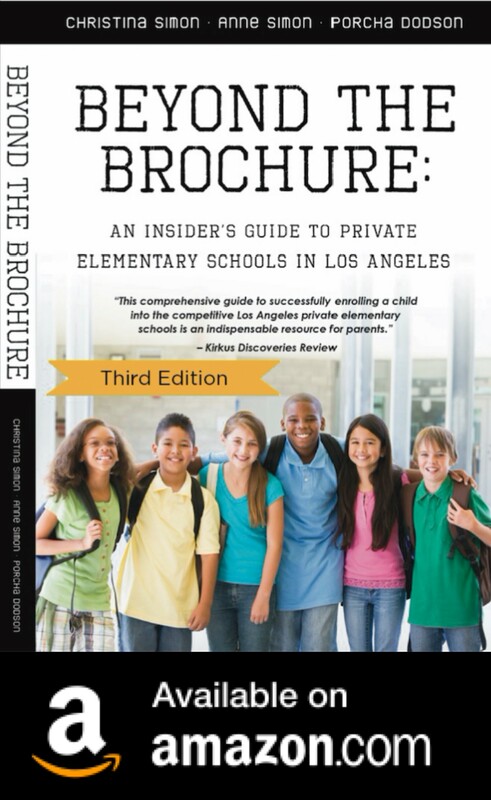 Jessica Gottlieb is a Los Angeles private school mom who writes the nationally acclaimed blog JessicaGottlieb.com. Jessica’s recent TV appearances include the CBS Evening News, KTLA News, CNN, HLN, Wendy Williams, Fox and Friends and The Daily Show. Her work has been written about at the LA Times, NY Times, LA Daily News, The Wall Street Journal, Ad Age, Ms. Magazine and more. That’s a truly excellent (and easy!) tip for evaluating a school or educational program!